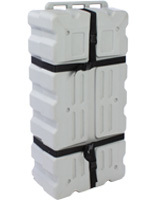 Use this tradeshow crate to protect and secure most any flat display or accessory. 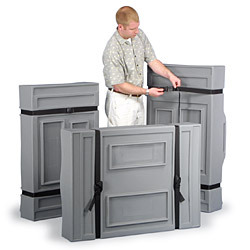 This trade show case is intended for storing modular exhibit panels between shows. 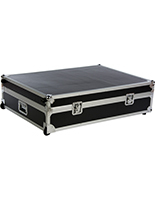 This crate holds items 48" long by 25" wide. The design of this trade show case allows it to hold anything from 7" to 10" deep. 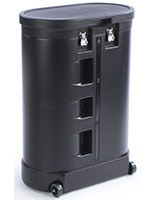 Made from tough LDPE plastic with heavy duty wheels. 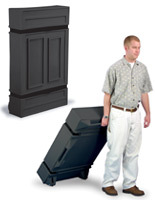 The trade show case for sale here features handles on two sides to allow for easy maneuvering and loading. 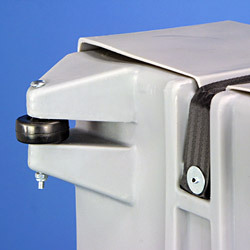 Securing straps are fastened to the bottom of the container, and connect to each other using quick release buckles. 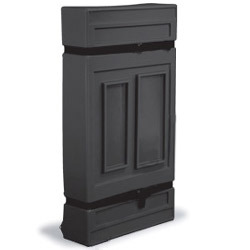 This trade show case has an overall size of 27" x 50" x 10" and weighs 30 lbs. 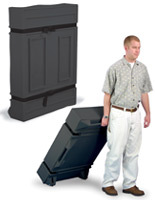 Use this tradeshow crate for storage of your accessories when not in use. 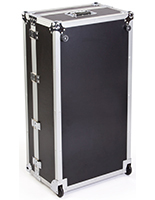 This trade show case provides one centralized crate to keep valuable fixtures for an event or demonstration. 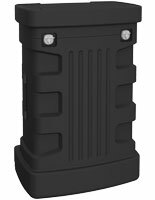 The large interior space within this trade show case is ideal for such items as; portable flooring, table top panel displays and other relatively flat accessories. 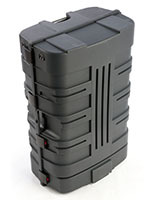 The straps and buckles can be tightened in an effort to keep the contents from shifting. 27.0" x 50.0" x 20.0"